The past couple of weeks, the weather in Nashville has been all over the place. We have had snow, rain, freezing temperatures, warm temperatures and lots of wind. As a result, Mother Nature provided some beautiful craft materials in the way of twigs, pine cones, leaves and acorns. So I figured I needed to put these beautiful things to good use and cook up some creative ideas for the holidays. 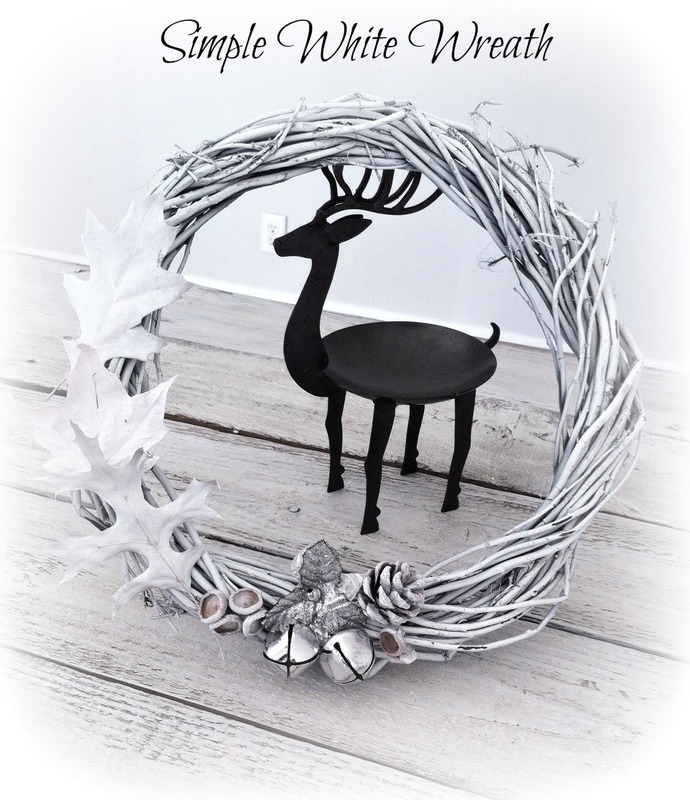 I have managed to make a simple white wreath and an Advent wreath – just in time for 1. Advent on November 30th. Here’s my latest project: a twig Christmas tree. I started with two pieces of old fence wood which I attached with screws. I sanded the pieces and white washed them by mixing a small amount of white paint with water. Next, I cut a few twigs and used Liquid Glue to attach them to the wood. Hot glue gun just didn’t do it for the thicker twigs. A few tiny twigs and some white spray paint is all it took to create this star. I figured these acorn caps would make cute ornaments. I spray painted them white, silver and gold and hot glued them to the tree. That’s all it took to make this natural, earthy and inexpensive Christmas decoration. I love the tree! And it matches the wreath so well too. So cute. Thanks, Maryann!Glad you like it. I love this tree so much! Pinning! Thank you for sharing on Show Me Saturday! Hi Patrizia! Thanks for the sweet comment.I am glad I was able to reuse items I had laying around the home and backyard to make this tree. Thanks for stopping by! Love your creations! I also do things like this. Make a tree from a pine one! Such a cute tree, and so creative! I’ve featured it on Worthwhile Wednesdays tonight. Thanks so much, Allie for the feature. I’m so glad you like the tree. Happy New Year! Aww that is so sweet. Thank you so much! I really enjoyed seeing your Christmas trees made with tomato cages. You did a good job . Thank you, Blanche. I really appreciate your kind comment. So glad you like the tree.